I encountered an interesting problem today. I had a SQL Server table with many records in it that I needed to clean up. Specifically, I needed to find all duplicate records in the table, but keep the first of each of the duplicate records. This is a multi-part statement that looks somewhat complex, but that definitely does the job it was designed for! Within the main select statement, the second nested query restricts the results of returned IDs to only show duplicate records. Then the first nested query ties everything together by removing from the list of duplicates the first record of each duplicate. The order of these nested queries is not really important. The main thing is that they exist. In the end this query allows us to remove duplicate records, but to keep all information from the first of each of the duplicate records, exactly what we want! Below is a full working example of the process in action. I ran this in SQL Server 2008 R2, but this SQL can run in any version of SQL Server 2000+. 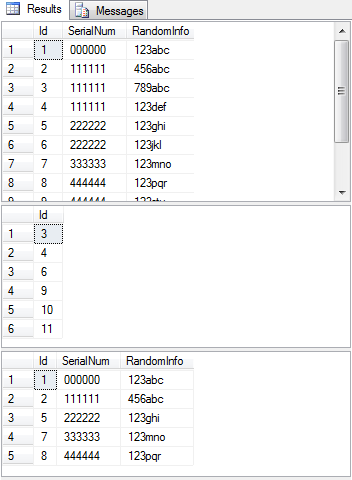 These are the results of the SQL to remove duplicates from a table but keep the first of the duplicate records.